When hacker Jose Julio thought about what you could do with 3D printer parts, besides 3D printing. 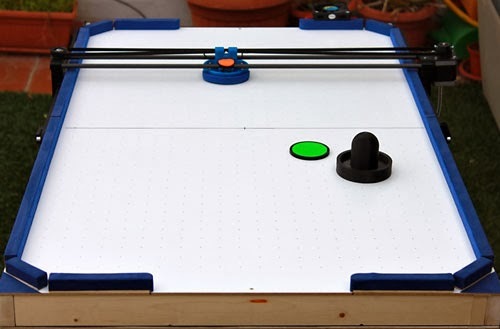 He came up with the idea to make an airhockey playing robot. Based on the idea of use standard RepRap 3D printer parts : NEMA17 stepper motors, drivers, Arduino Mega, RAMPS, belts , bearings, rods, printed pieces … I started to develop the project. The main advantage of use these parts is that they are cheap and easily available. interesting use of a 3d printer. Super creative haha we need more of those in canada.